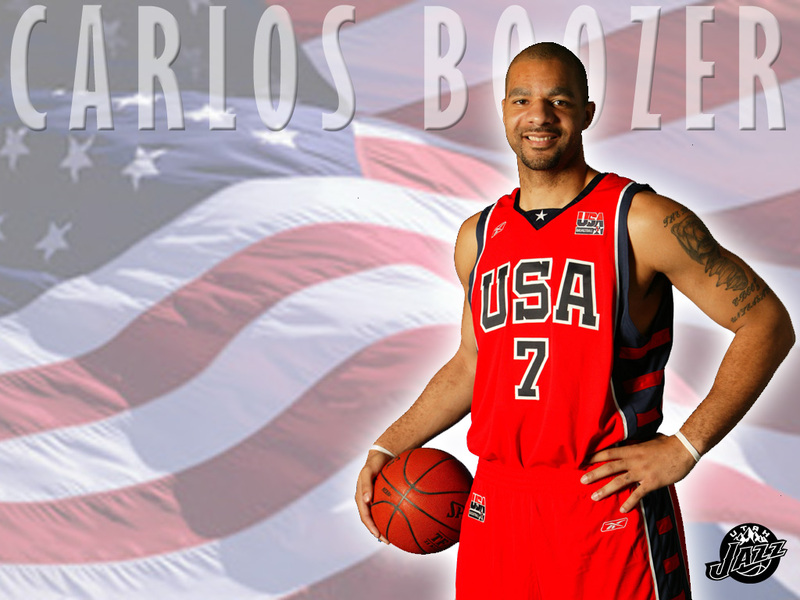 december 2010. 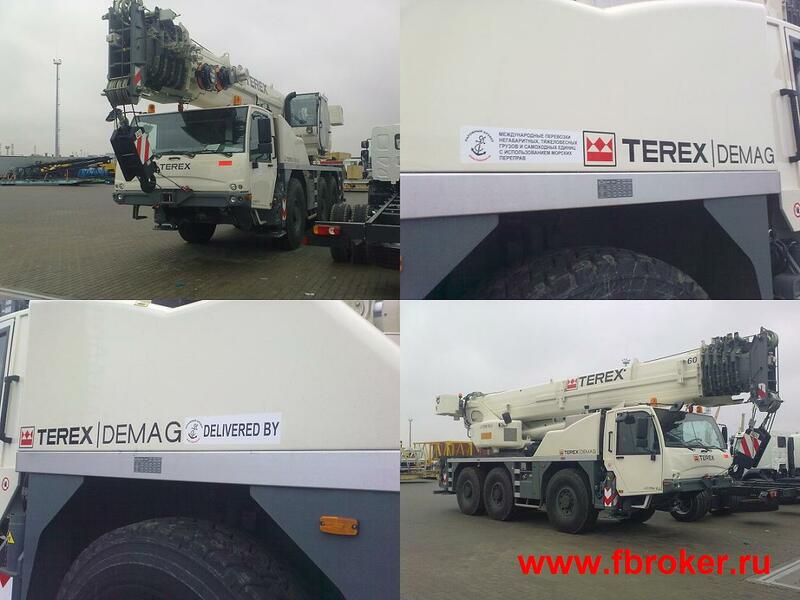 Transportation of mobile crane «Terex Demag» from Germany to Russia, including transfer on own wheels within Europe. 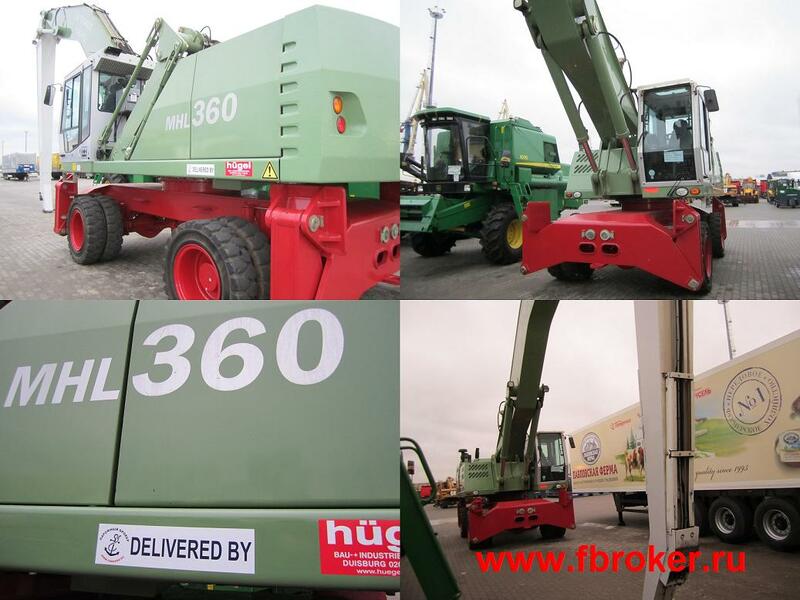 Total weight of crane with counterweights - 115t. november 2010. 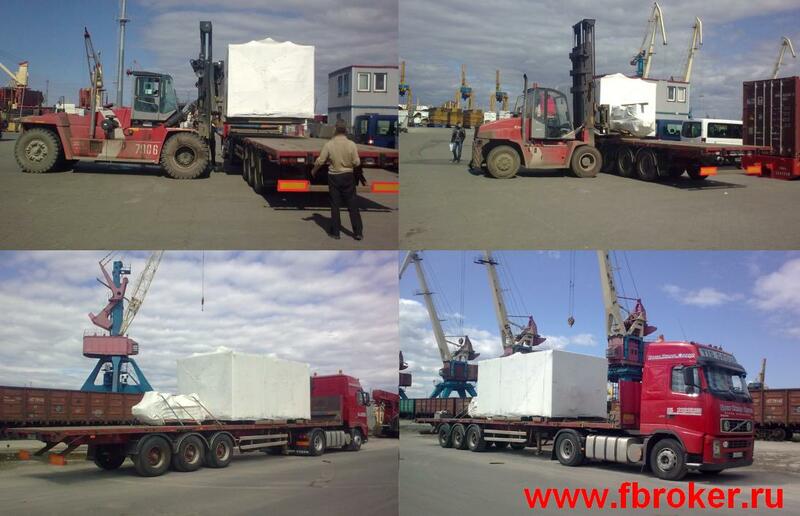 Transportation of terminal truck head from Finland to Saint-Petersburg, transfer on own wheels within Saint-Petersburg. 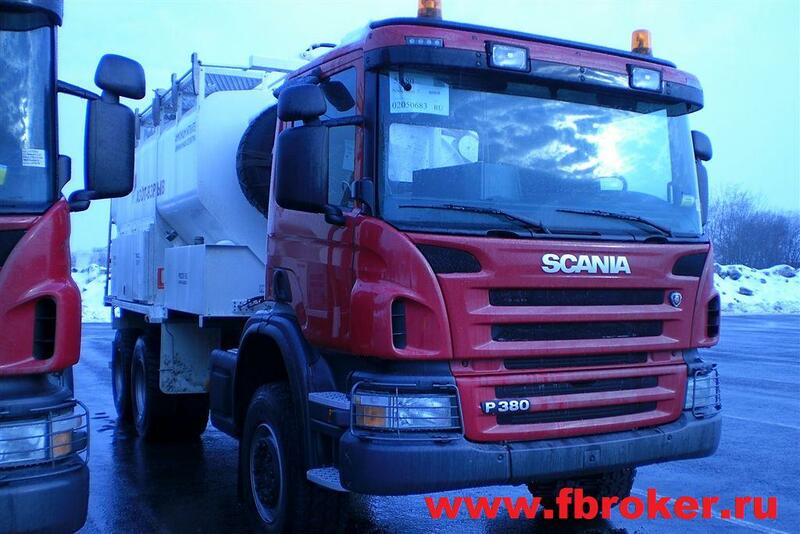 Delivery to the Port of Helsinki was affected by partner company Saimaan Transport Oy. november 2010. 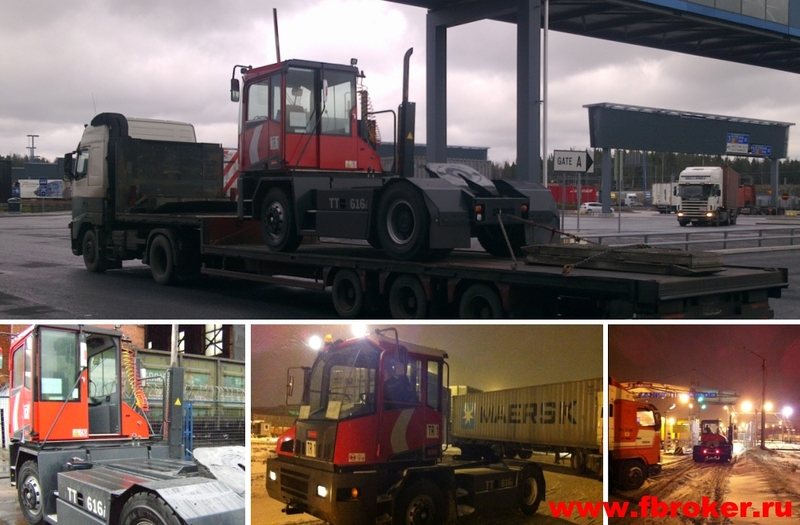 Transportation from Germany to Russia, intraport forwarding (PetroLesPort Terminal) and customs clearance of "Fuchs" loader. november 2010. 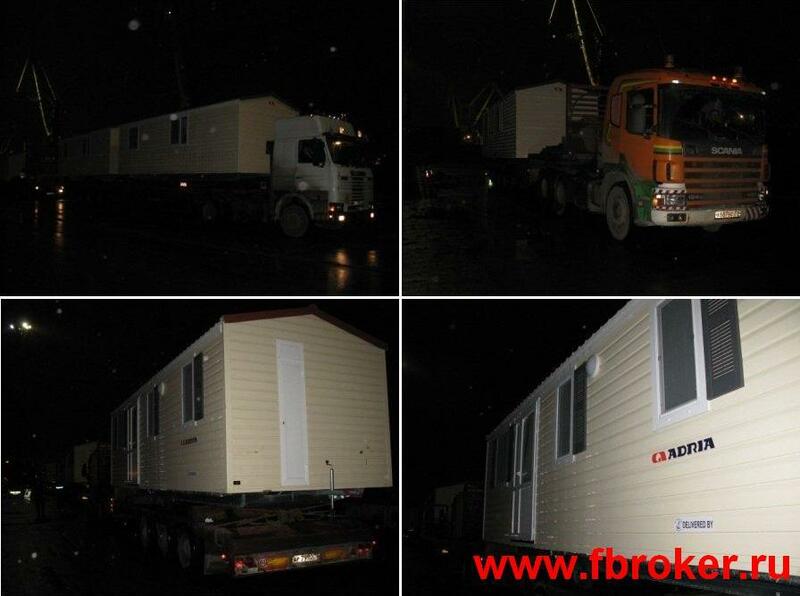 Intraport forwarding of mobile houses on chassis loaded onto Consignees' transport. Each modul length - 8m. october 2010. 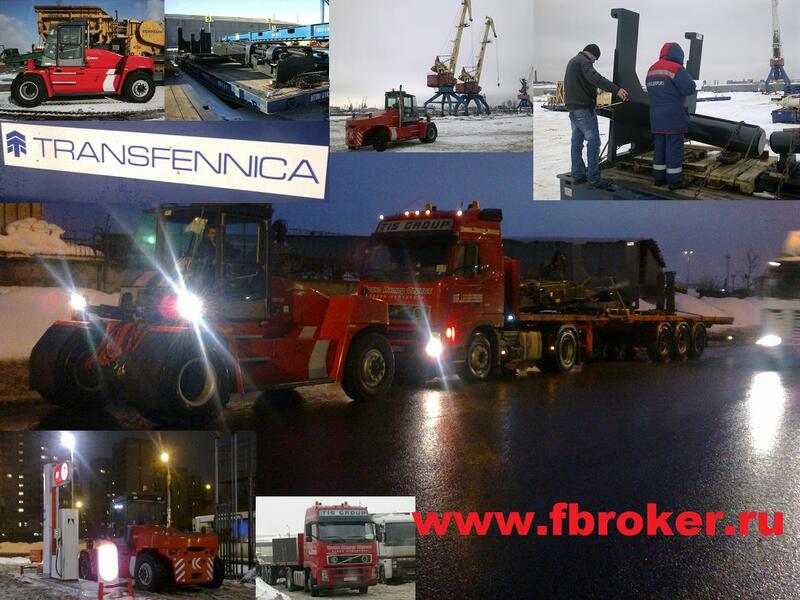 Export customs clearance and transportation of special medical equipment from Italy to Saint-Petersburg. october 2010. 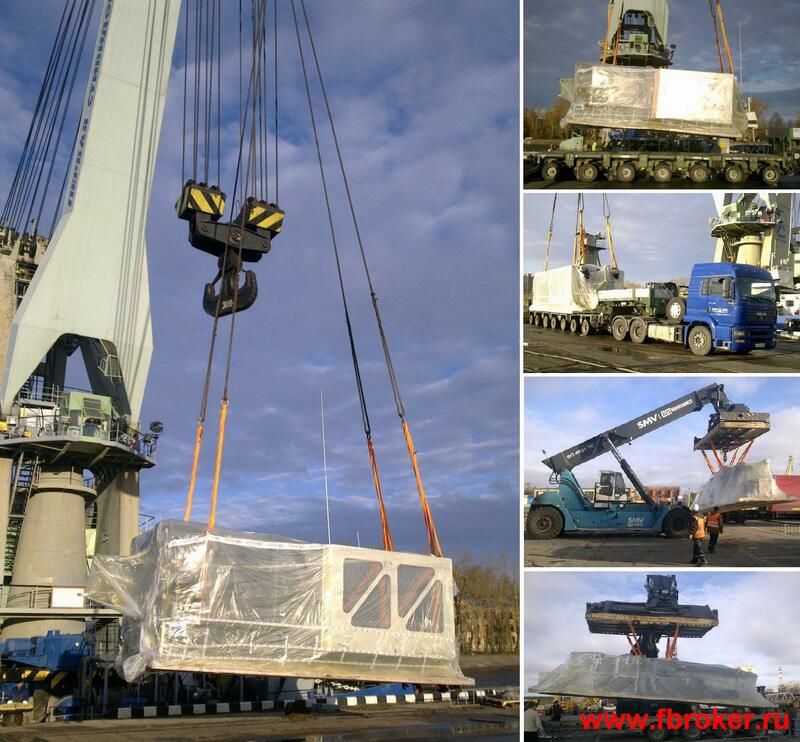 Providing the shifting with floating crane of dismantled press parts - 82tn and 28tn, transportation under home customs transit (HCT) to Sestroreck in cooperation with partner company "Keen Mark". october 2010. 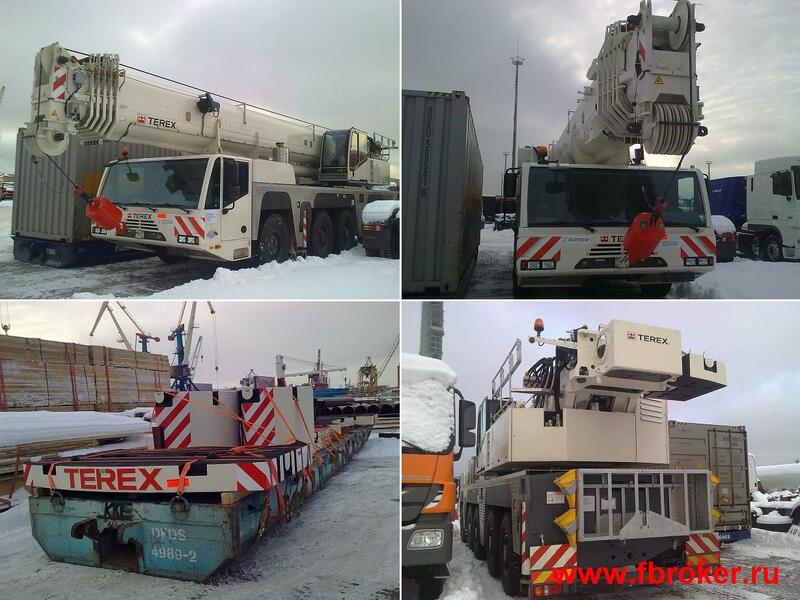 Transportation of mobile crane «Terex Demag» from Germany to Russia, including transfer on own wheels within Europe. october 2010. Intraport forwarding of equipment. Weight 57tn. 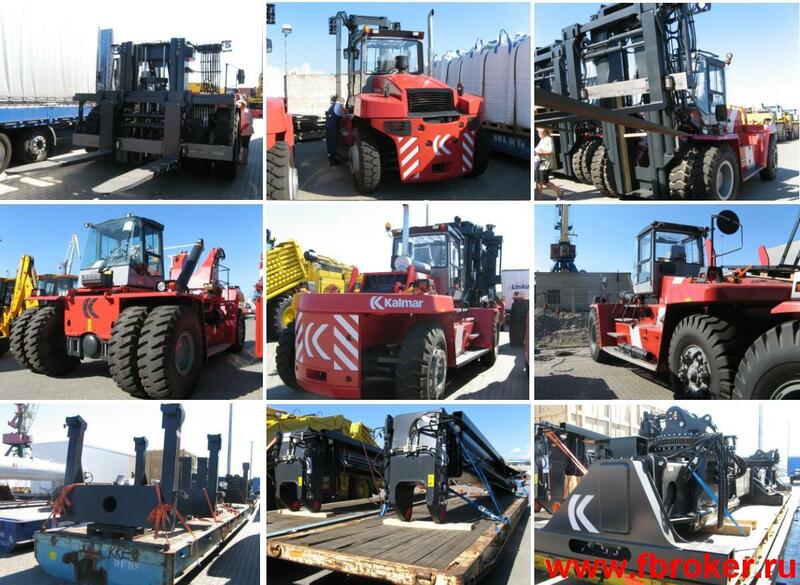 customs clearance and on-carriage to Consignees' warehouse. october 2010. 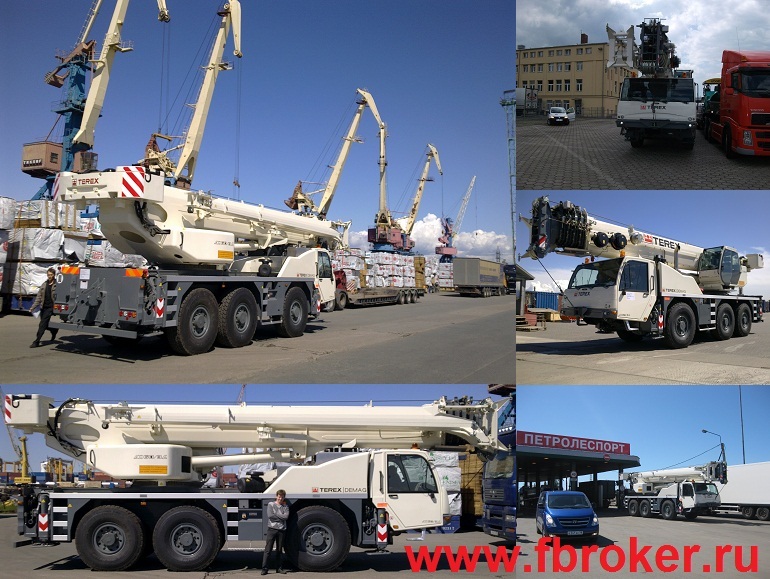 Transportation of large consignment of cranes from Sweden to Saint-Petersburg and Moscow in cooperation with partner company Saimaan Transport Oy. september 2010. 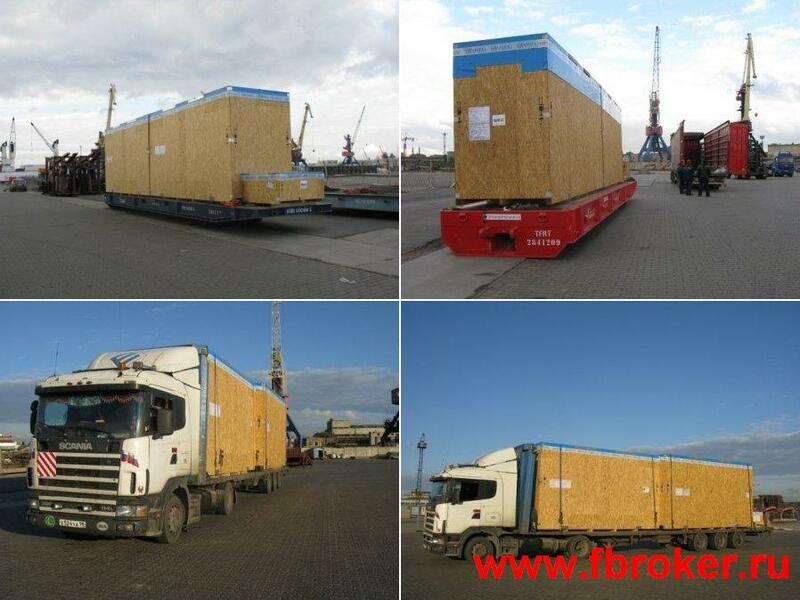 Intraport forwarding of equipment and further delivery to oil-processing plant in Tuapse. august 2010. 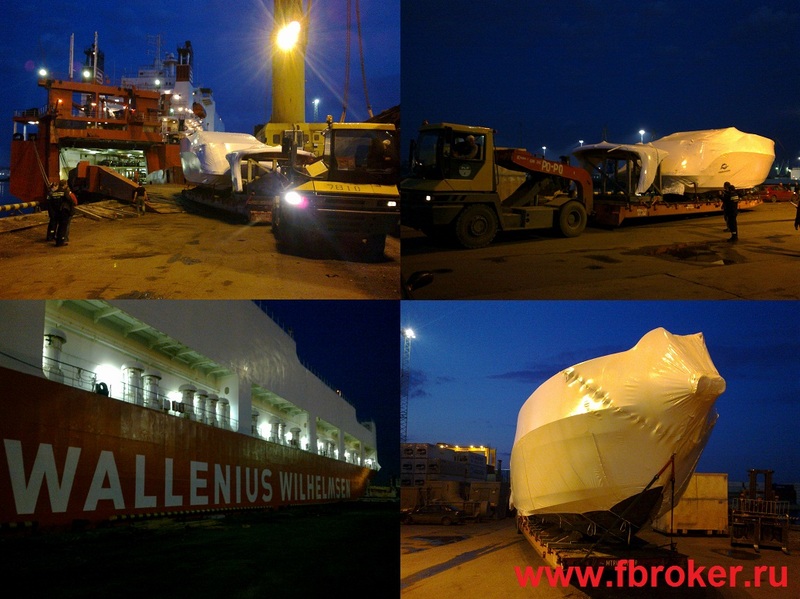 Intraport forwarding and preparation for home customs transit (HCT) road-train loaded oversized and heavyweight cargo. august 2010. 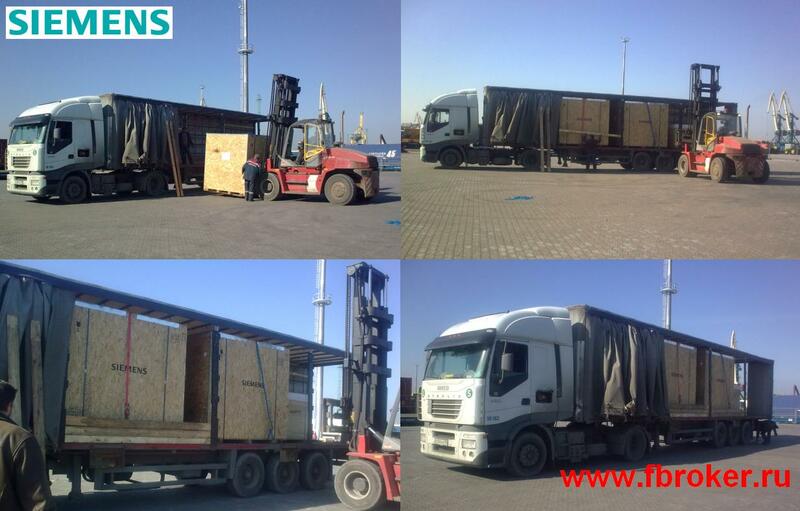 Transportation from Germany to Russia and customs clearance of consignment of loaders «Fuchs», including transfer on own wheels within city. august 2010. 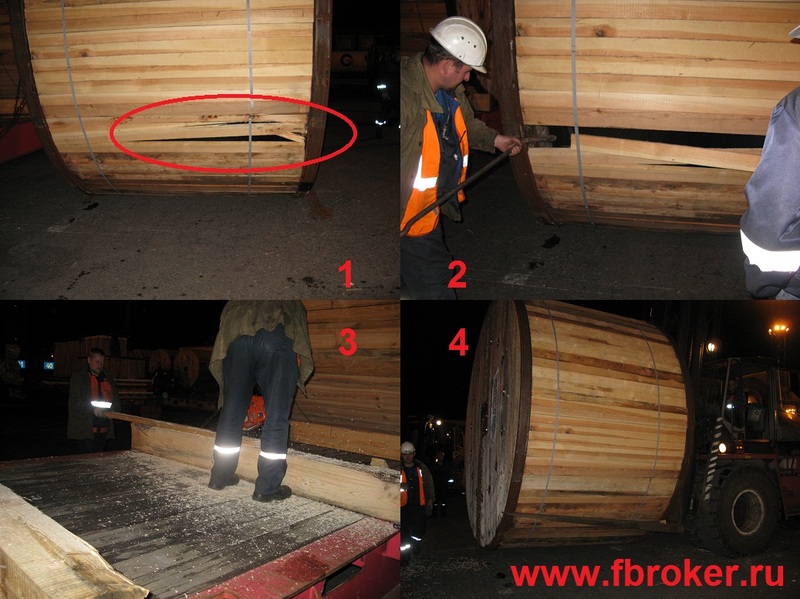 Intraport forwarding and repairing the cargoes' tare . august 2010. 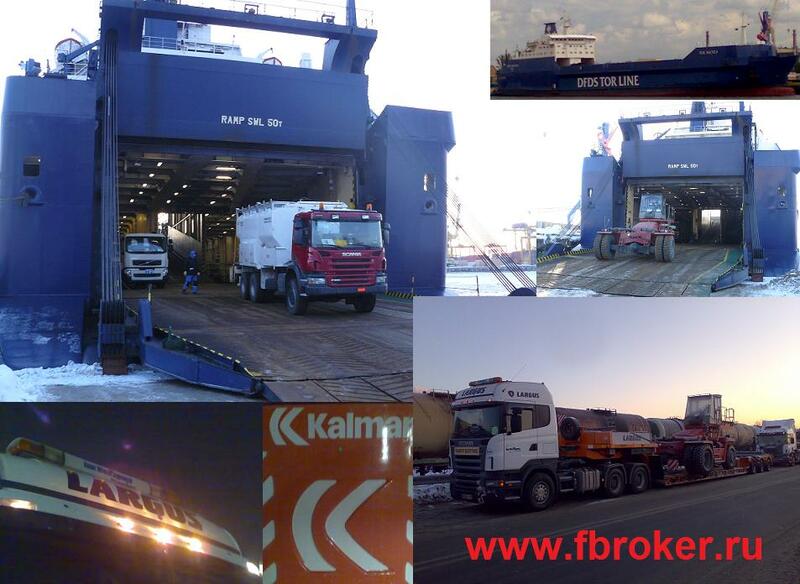 Transportation of large consignment of new self-propelled vehicles from Sweden, intraport forwarding and further delivery to Ust-Luga and Novorosijsk. august 2010. 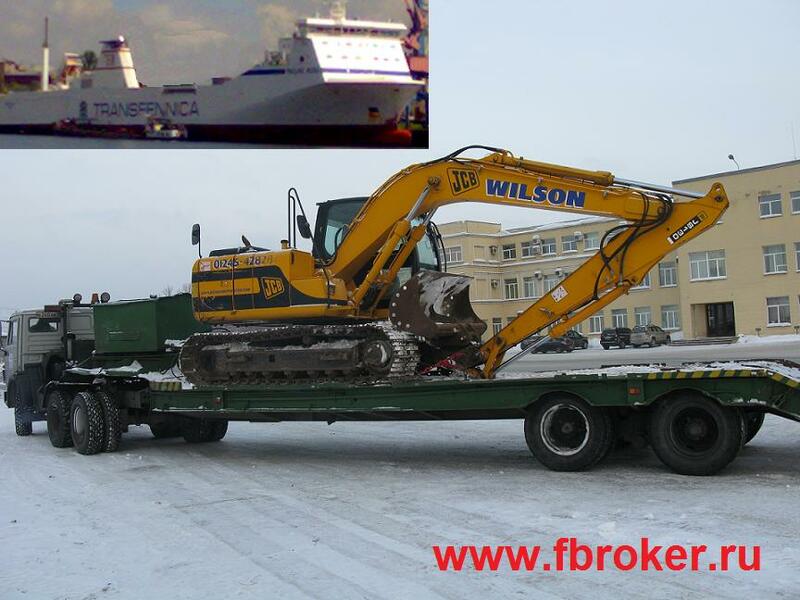 Intraport forwarding and dismantling the vehicle in the port for further delivery to Monchegorsk (Murmansk region). july 2010. 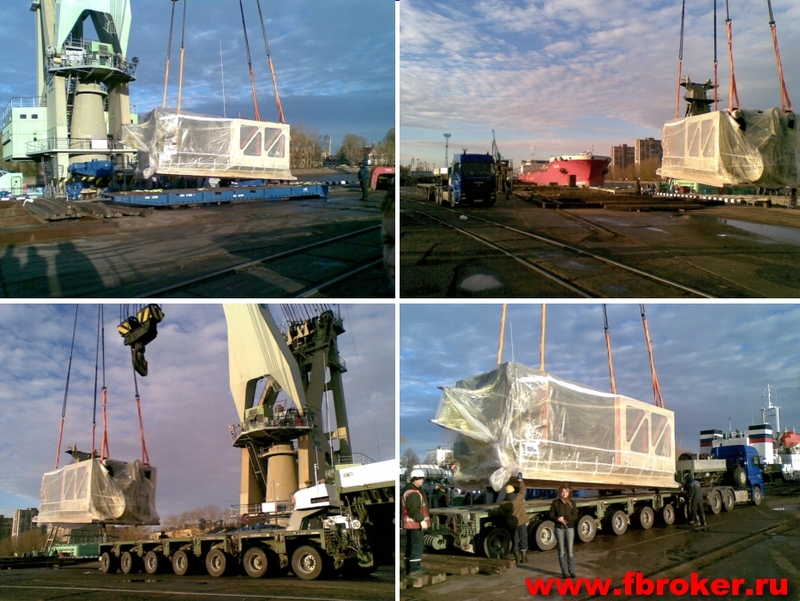 Transportation of dismantled cooling equipment from France to Nizhnekamsk. Width of pieces - 4,18m. Total weight 74tn. july 2010. 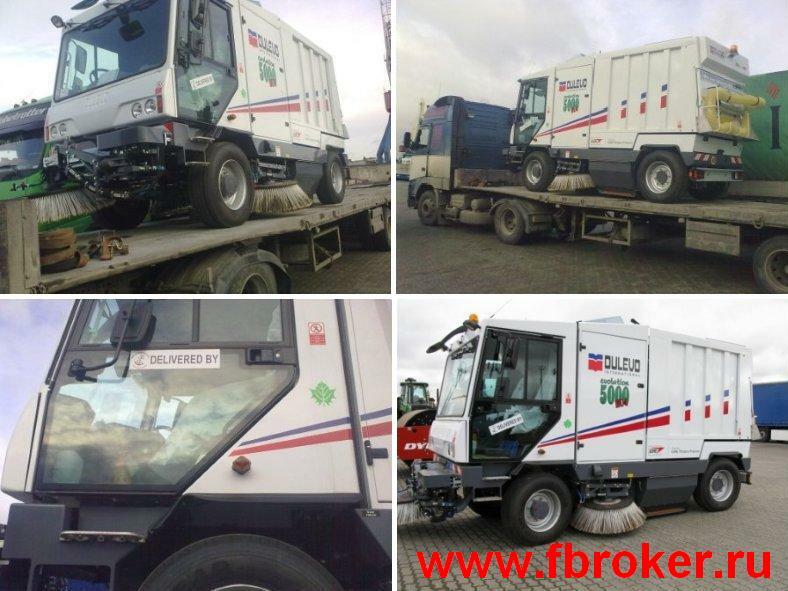 Transportation of new self-propelled vehicle from Sweden to Saint-Petersburg and transfer on own wheels within the city. 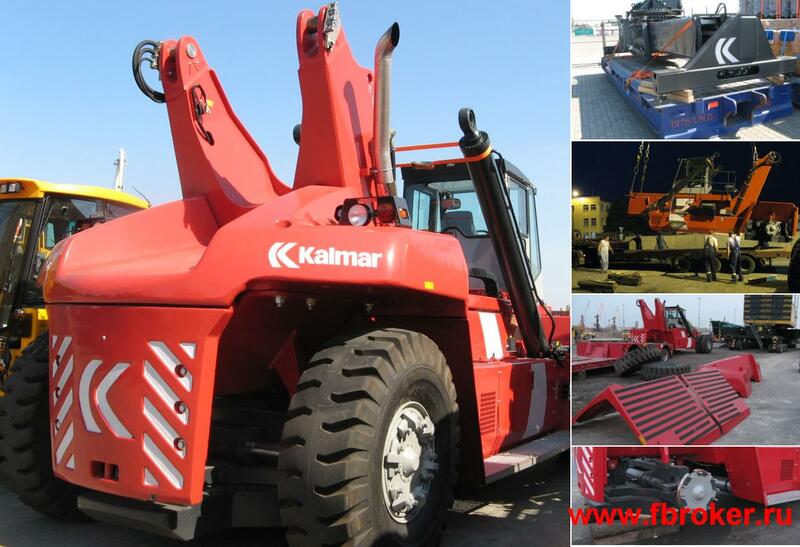 Width - 4,18m, weight 69 500kg. june 2010. Intraport forwarding, preparation for international customs transit (ICT) of oversized and heavyweight cargo piece , further shifting with mobile cranes to air transport. june 2010. 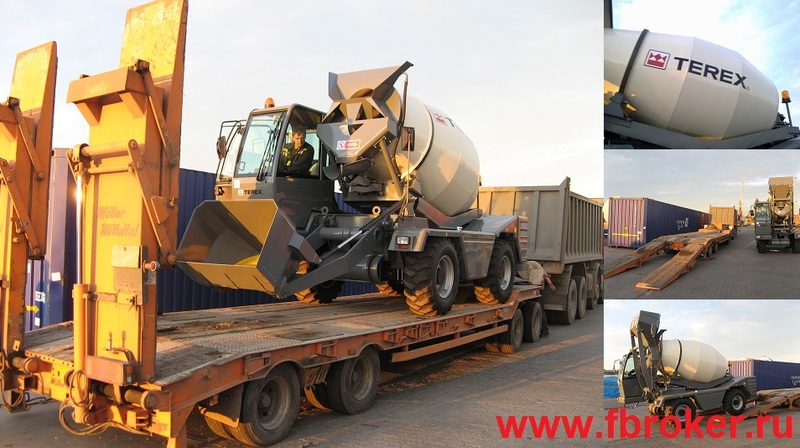 Transportation of concrete mixer «TEREX» from Italy to Russia. june 2010. 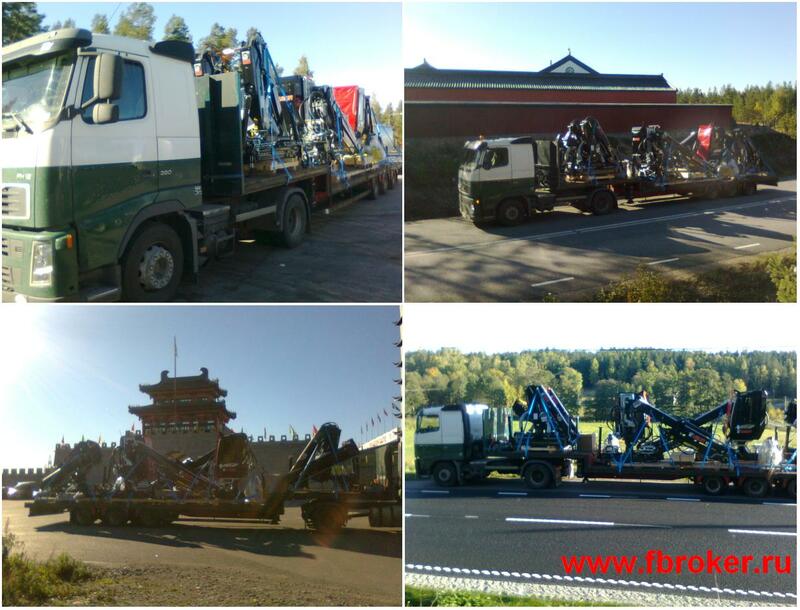 Transportation of 4 terminal truck heads to Ust-Luga with support of partner company Saimaan Transport Oy. june 2010. 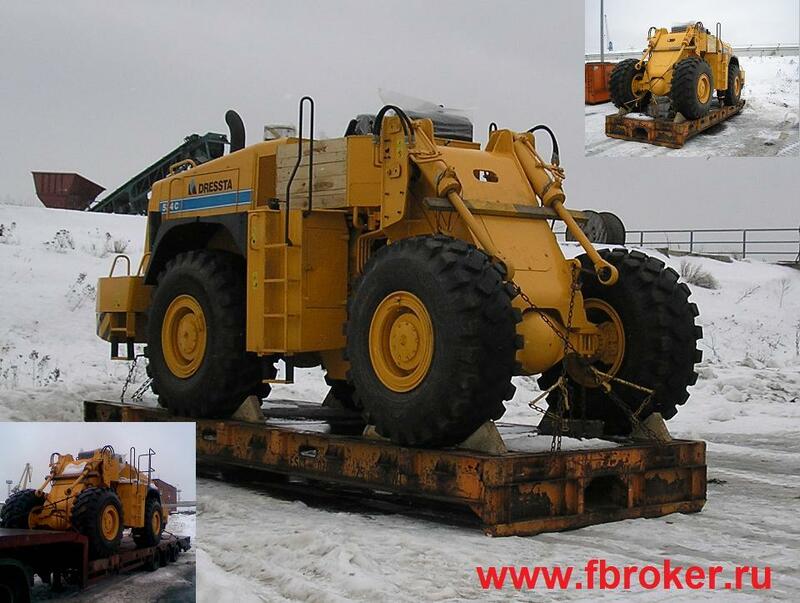 Transportation of loader within Russia with wheels dismantled. june 2010. 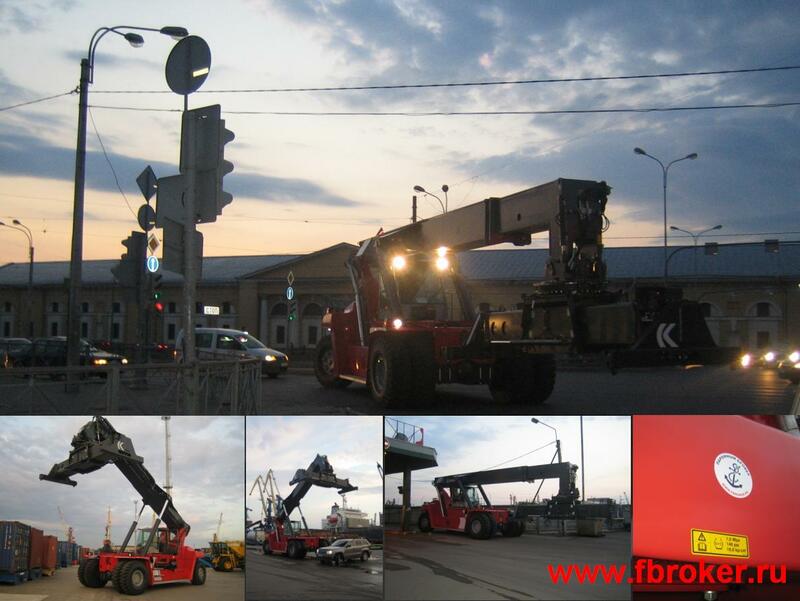 Transportation of mobile crane «TEREX DEMAG» from Germany to Russia under FCR (Forwarder's Certifiсate of Receipt). june 2010. 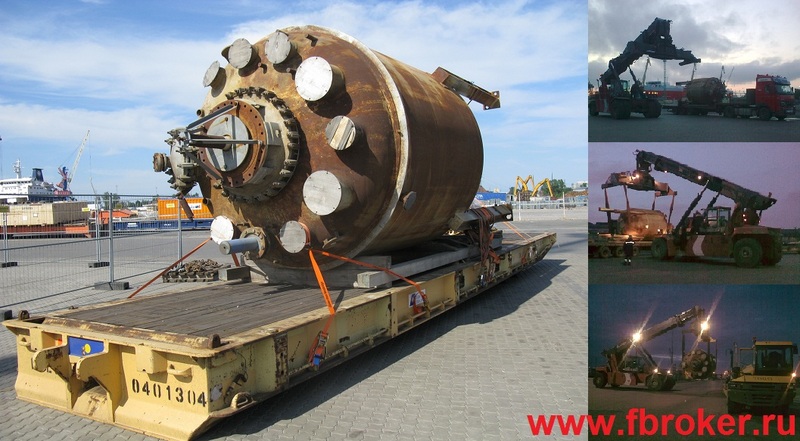 Multimodal transportation of reactor from Russia to Germany for reconstruction works. 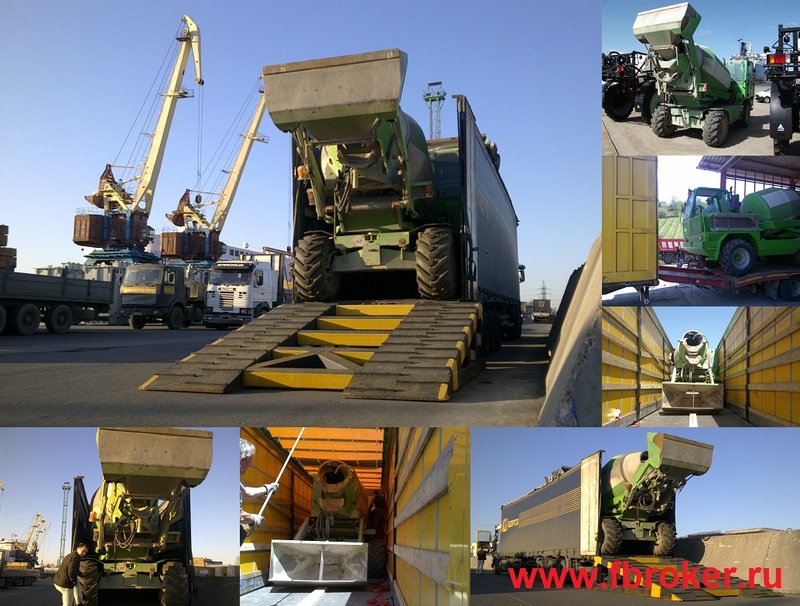 Carriage affected in cooperation with partner company «MBM-Trans». june 2010. 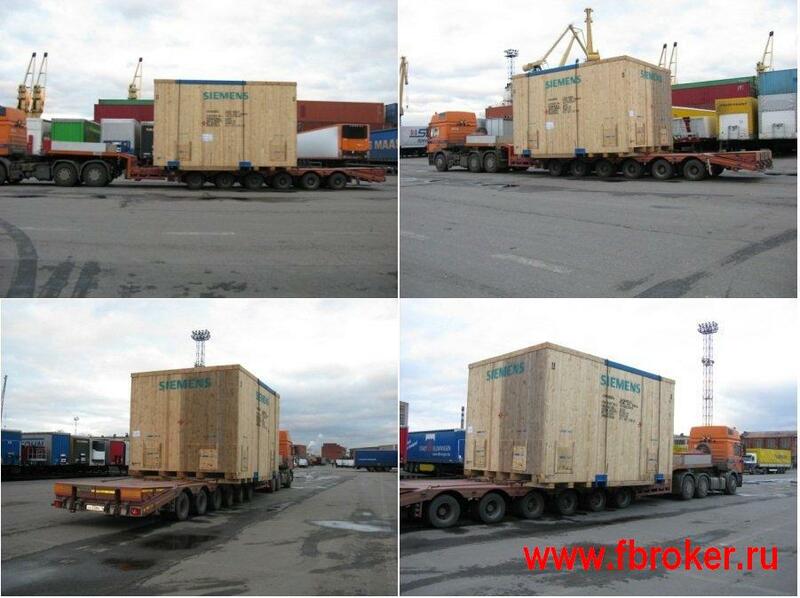 Intraport forwarding, arranging for home customs transit (HCT) and delivery to Moscow of airfield cooling equipment. Carriage affected in cooperation with partner company «TIS GROUP». may 2010. 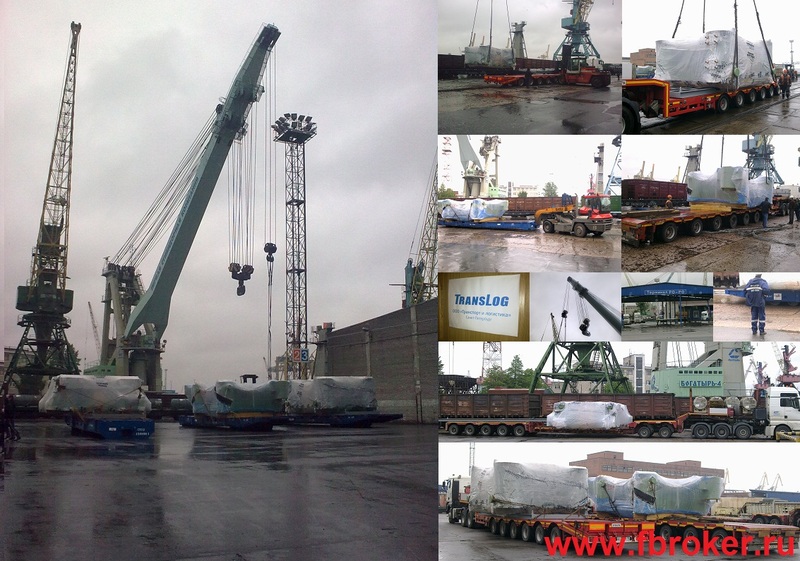 Transportation of boat from Germany to Russia. Length 13m, width 4m. may 2010. 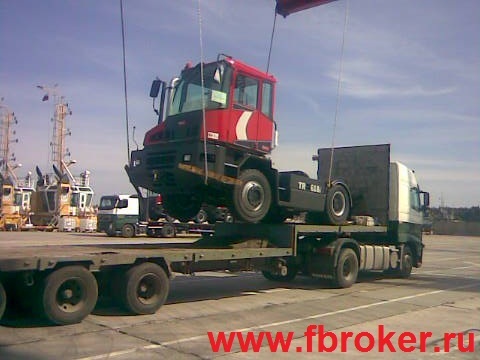 Intraport forwarding of loader and rolling on the Consignees' truck. may 2010. 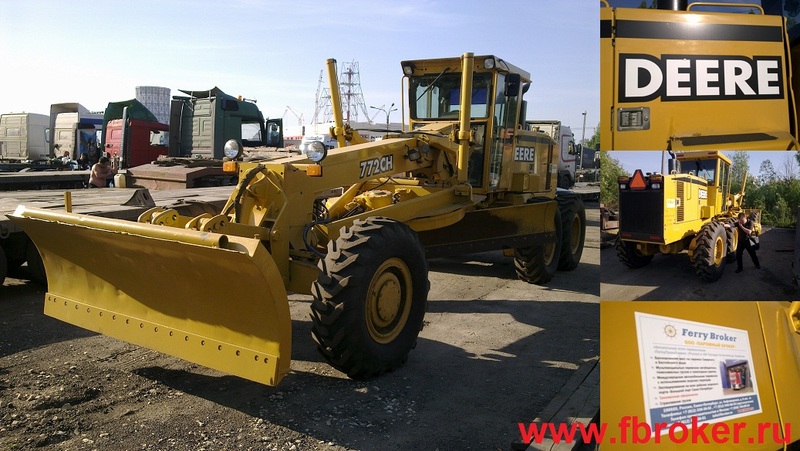 Intraport forwarding of caterpillar vehicle "CAT" and transportation within Russia. may 2010. 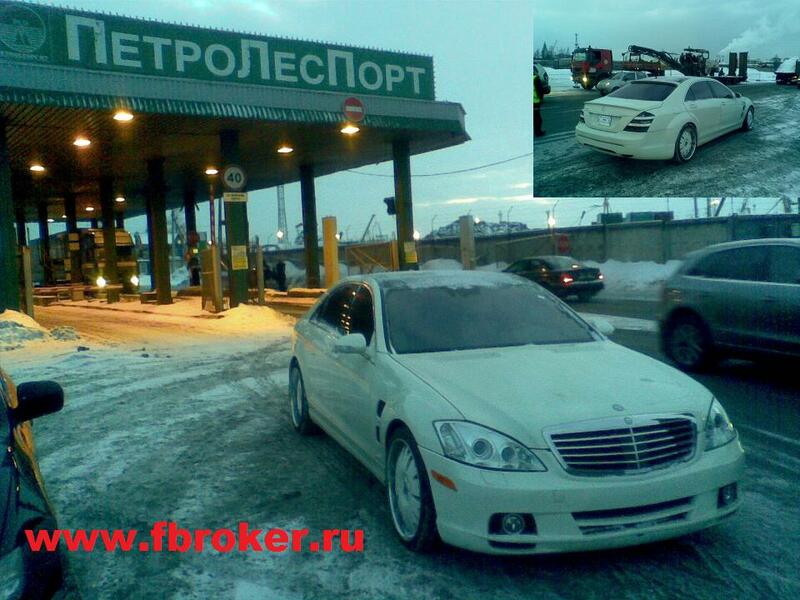 Intraport forwarding of vehicle «DEERE» and further delivery within Russia. may 2010. 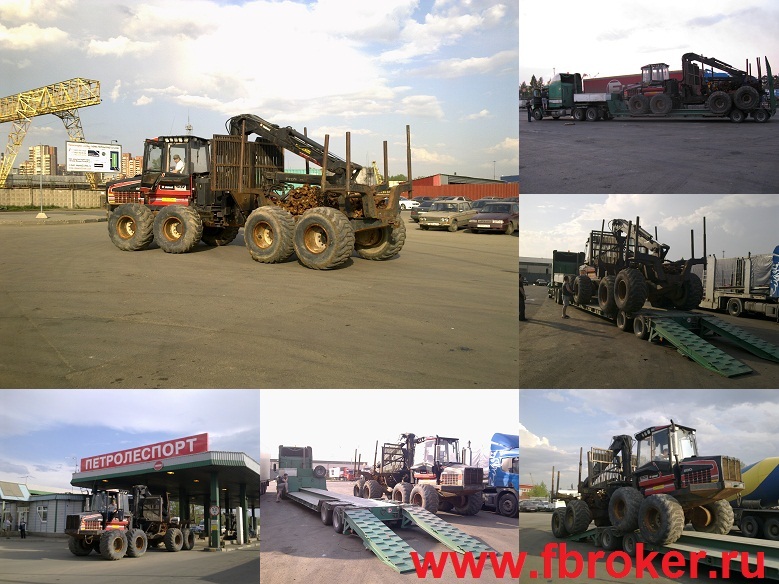 Intraport forwarding of trailers for livestock and driving within Russia. Length 18m. may 2010. 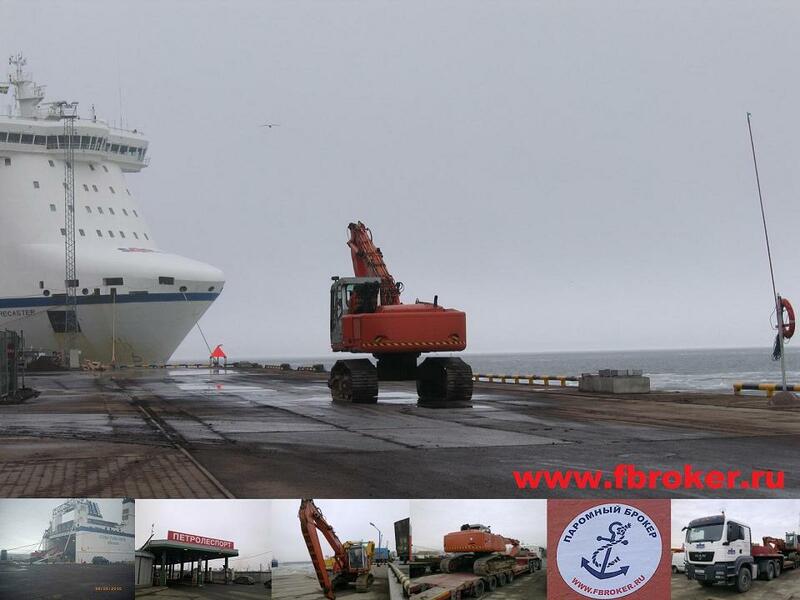 Intraport forwarding, home customs transit (HCT) clearance, providing the shifting with floating crane. Max.weight of cargo piece – 98,6tn. april 2010. 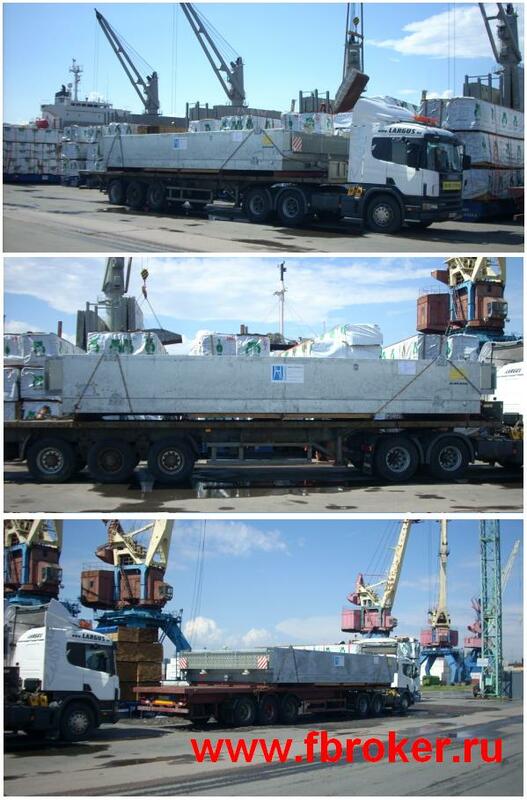 Transportation of vehicles from Italy to Russia including on-carriage in mega-trailers. april 2010. 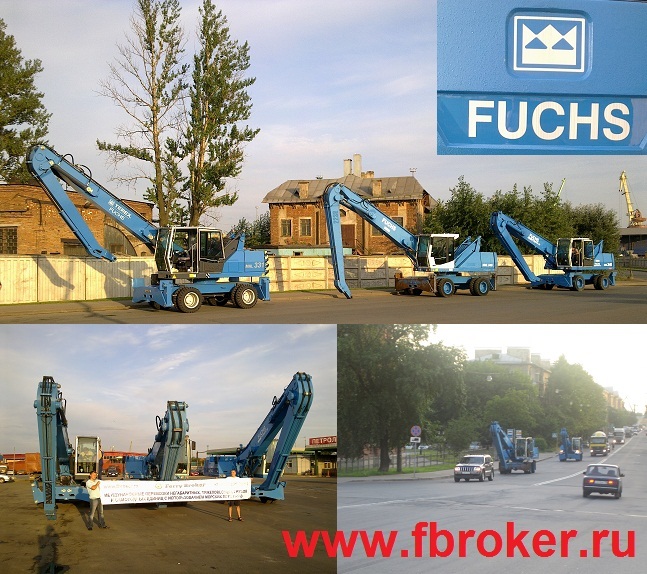 Transportation of loaders «Fuchs» from Germany to Russia. april 2010. 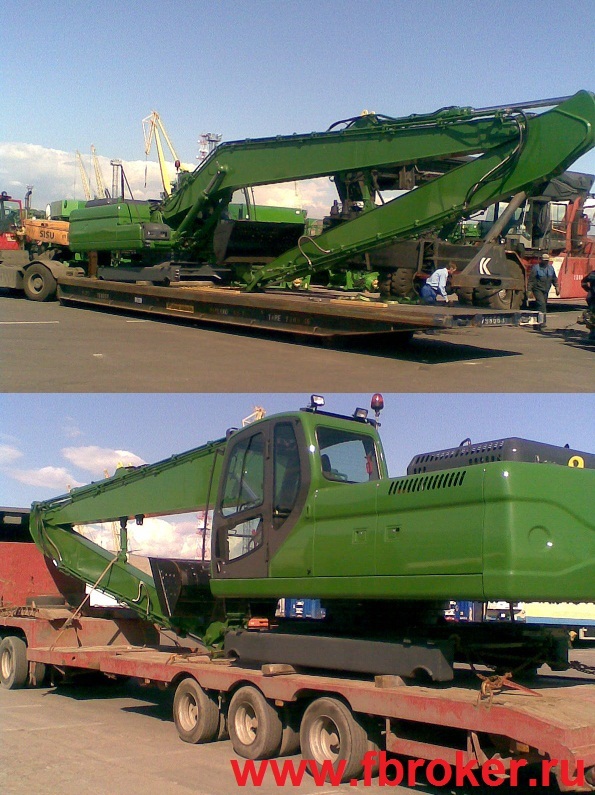 Transportation of caterpillar vehicles from Germany to Dagestan Republic. Special satellite tracing system was installed for the period of transportation. april 2010. 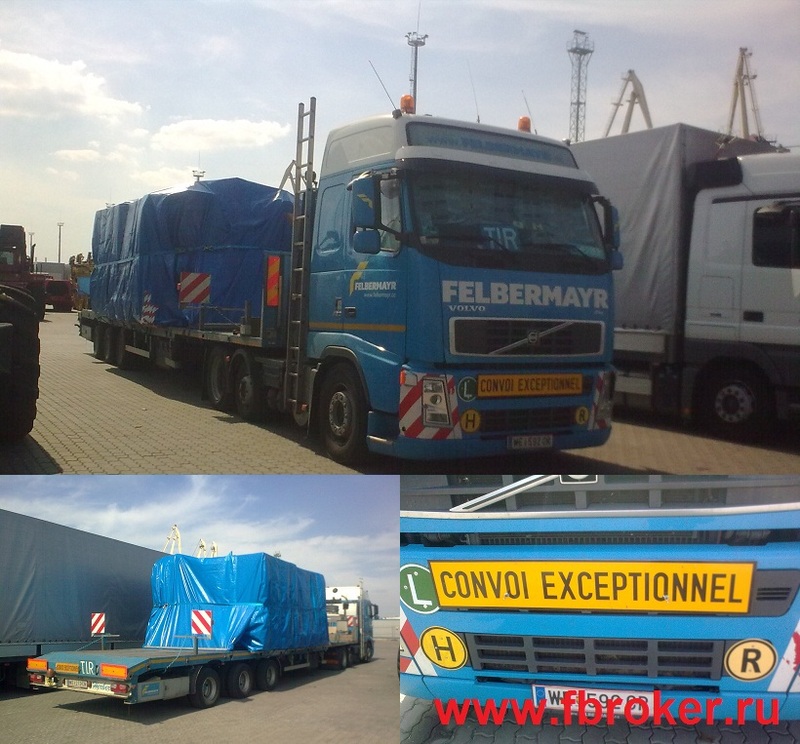 Transportation of caterpillar vehicle from Germany to Russia in cooperation with partner company "MBM-Trans". april 2010. 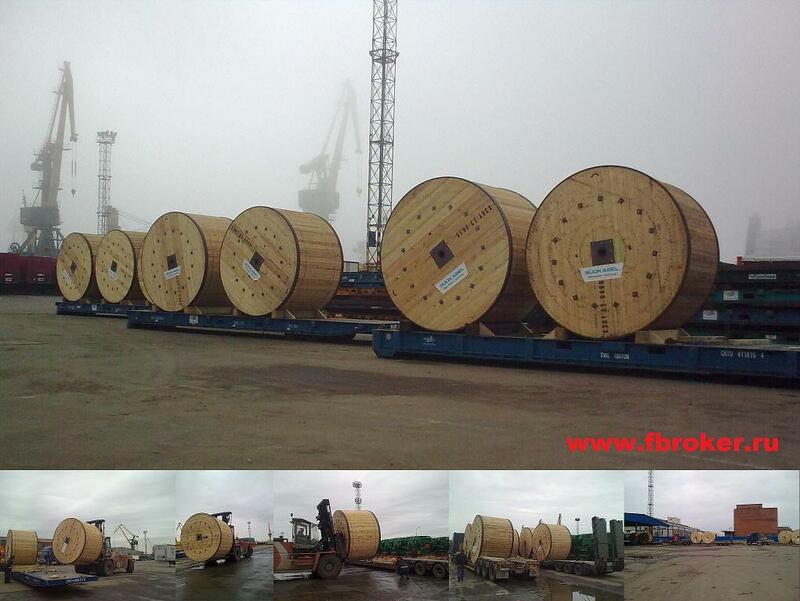 Intraport forwarding of 23 drums weighting up to 17tn ( «Port of St. Petersburg», Second region terminal "Translog"). april 2010. 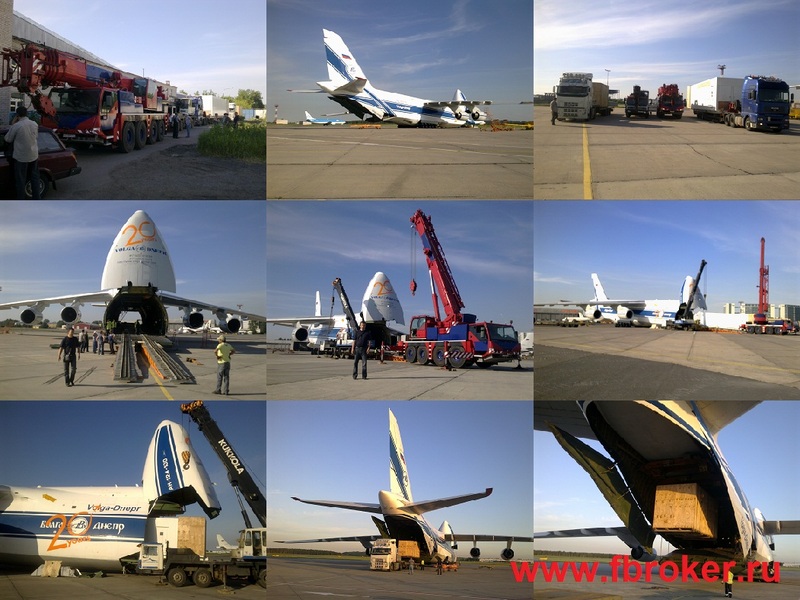 Transportation of equipment from Germany to Russia. march 2010. 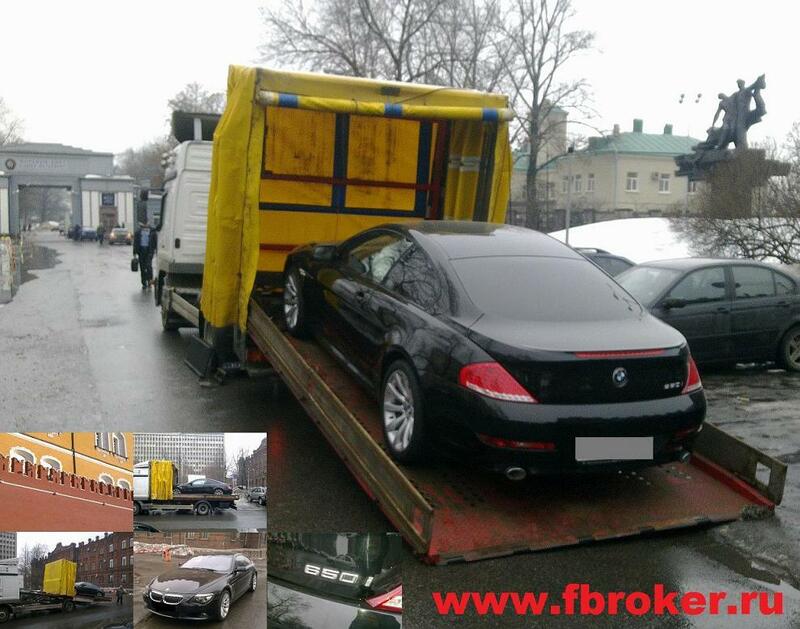 Transportation of BMW 650i from Moscow to Lubeck. Vehicle was carried in special covered wrecker, designed for trasportation of vehicles with low clearance. march 2010. Home customs transit (HCT) of vehicle. february 2010. 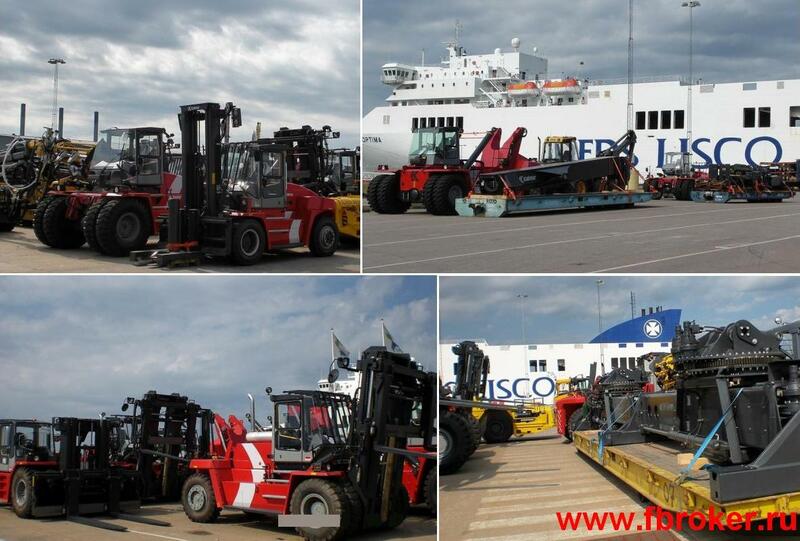 Transportation of new self-propelled vehicles from Sweden. february 2010. Transportation of new self-propelled vehicles from Sweden to Saint-Petersburg and further transfer on own wheels within the city to final destination. 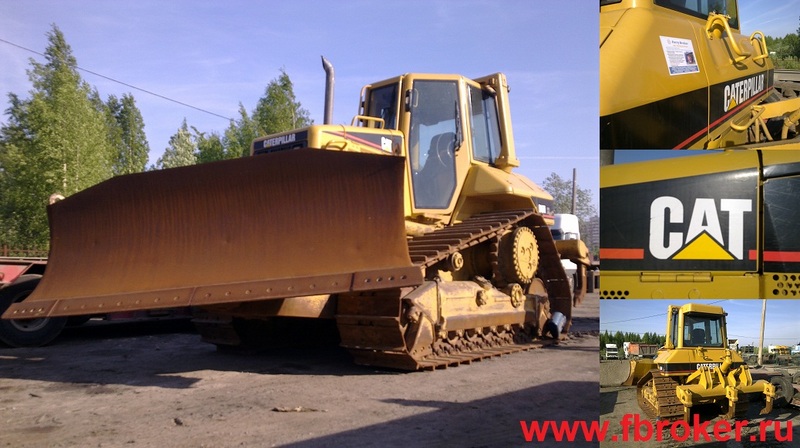 Width - 3,4m, weight - 41900kg. february 2010. 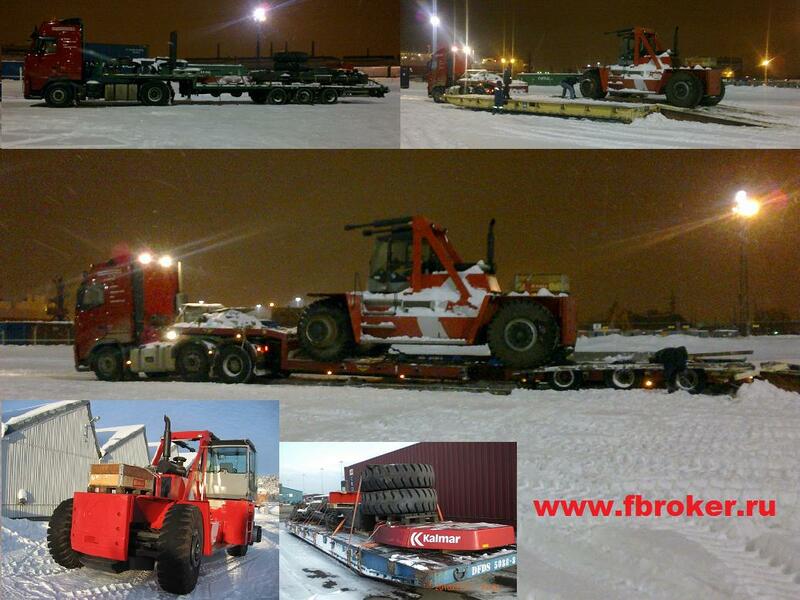 Transportation of new self-propelled dismantled vehicles with parts from Sweden and further delivery to Novorossijsk. 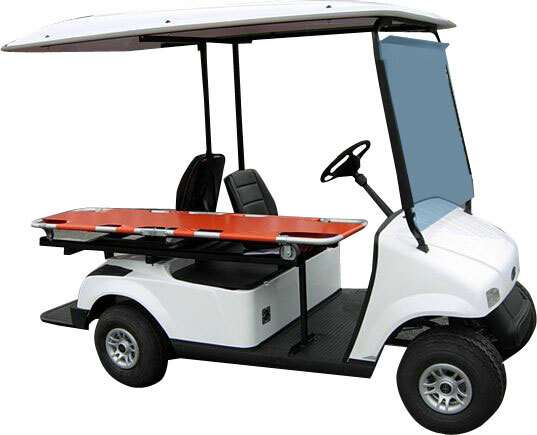 Width of of transported vehicle base - 3,86m, weight - 25700kg. february 2010. 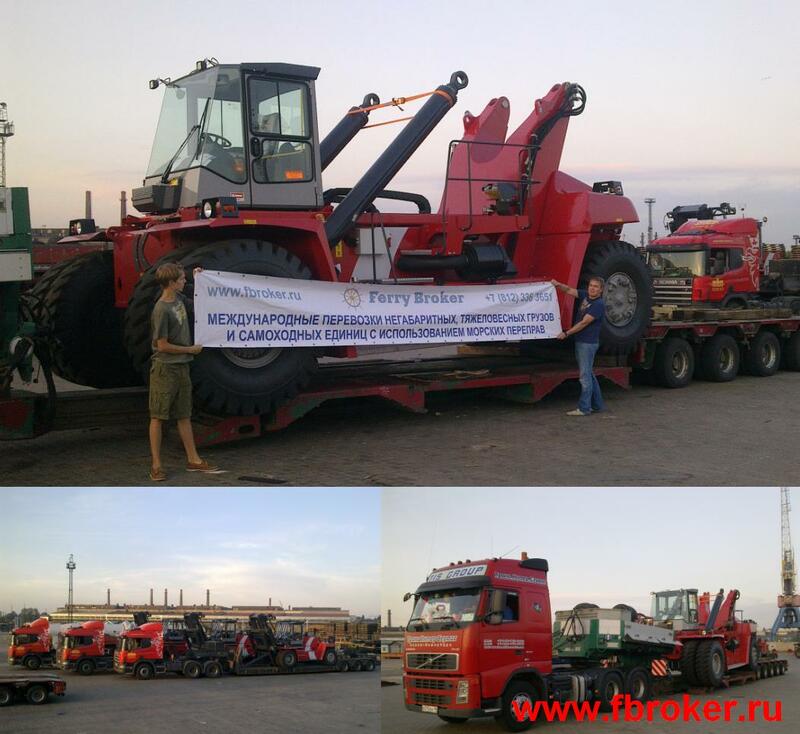 Transportation of self-propelled vehicles and equipment from Belgium to Russia in cooperation with partner company «TIS GROUP». february 2010. 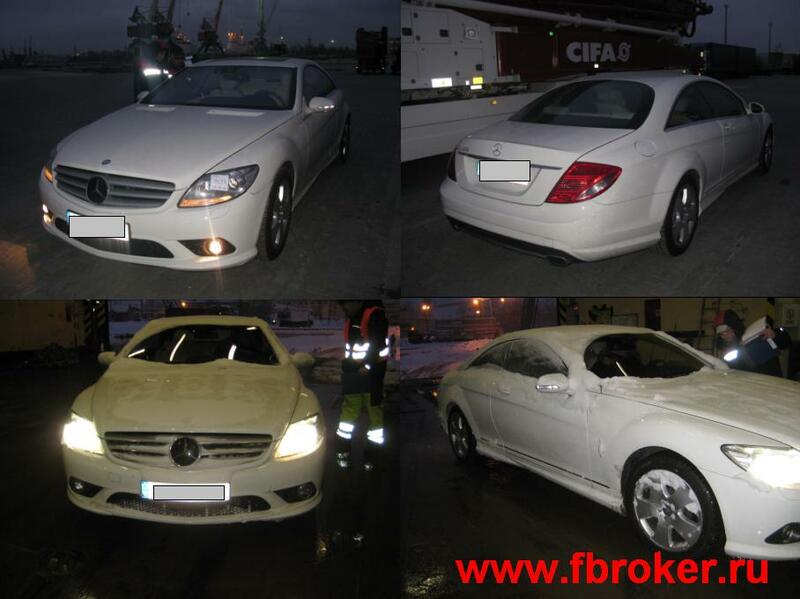 Clearance of vehicle for re-export from Russia to Latvia, delivery by several ferry lines. You can trust us "millions" with confidence! february 2010. 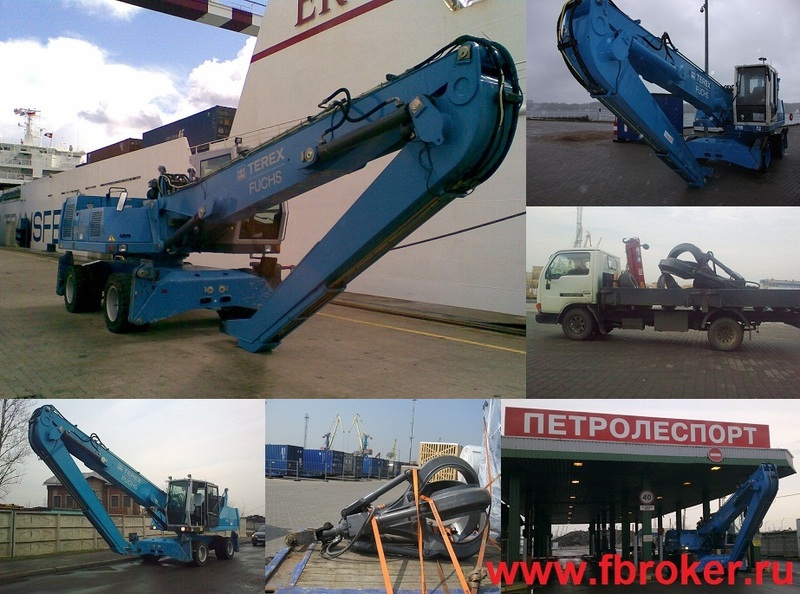 Transportation of spare parts for portal crane from the Netherlands to Russia. february 2010. 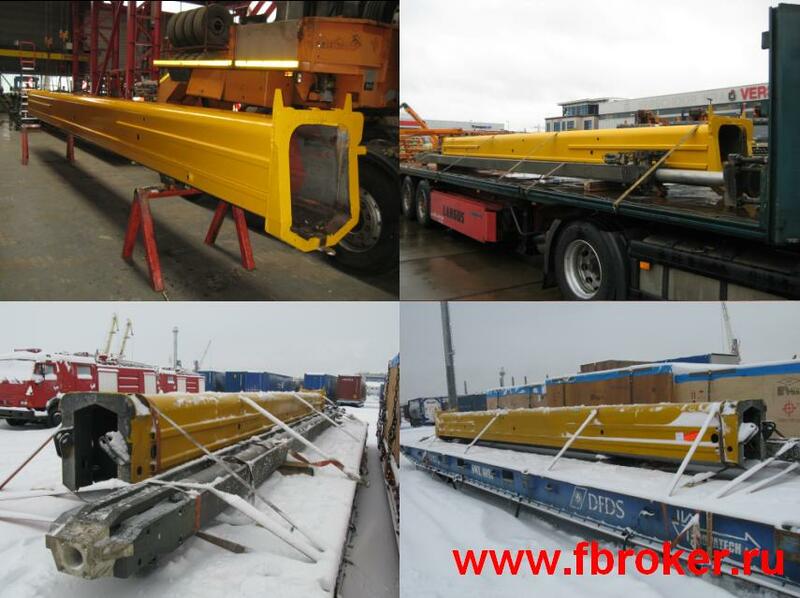 Transportation of dismantled wheeled loaders on roll-trailers from Germany to Russia, further on-carriage to final destination by low-bad trailers. january 2010. 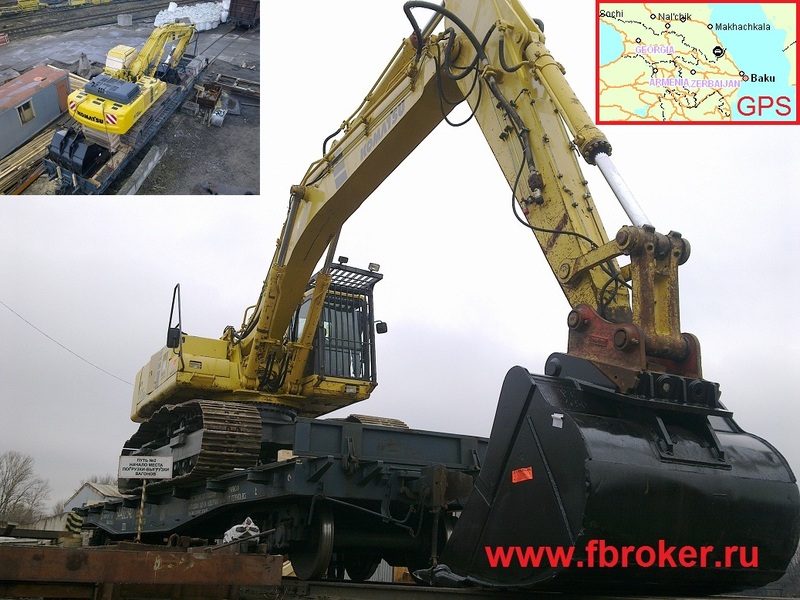 Transportation of excavator from the Great Britain to Russia. january 2010. 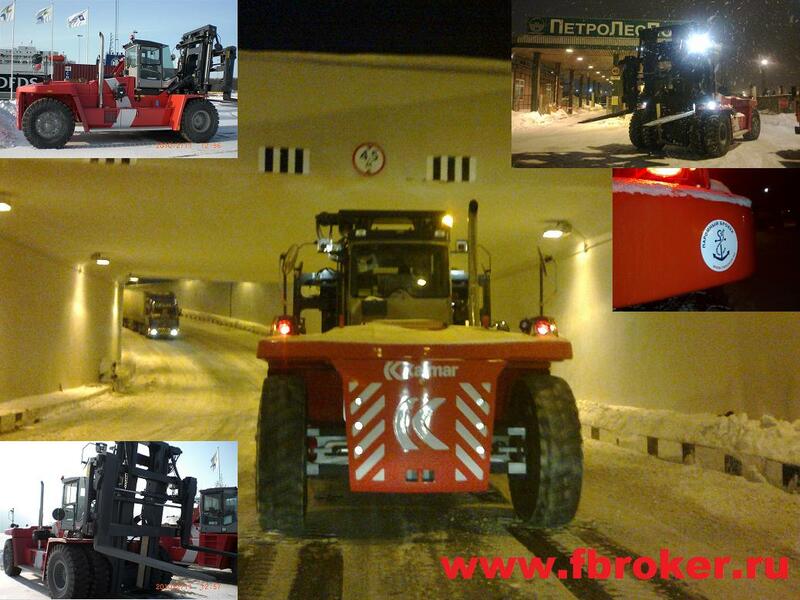 Transportation of different wheeled vehicles from Sweden to Russia, including support of partner company "Largus Group". Width - 4,1m.